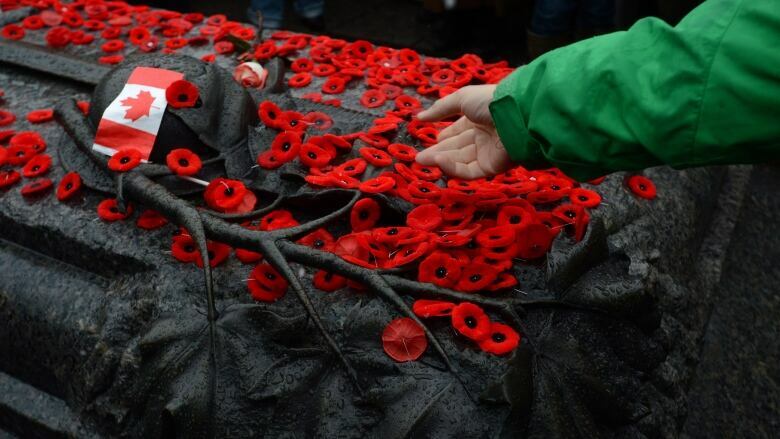 There are several Remembrance Day ceremonies in Ottawa on Nov. 11 and there are also some closures. We have listed all the ceremonies and every piece of information you need for Remembrance Day. There are several Remembrance Day ceremonies throughout Ottawa, which will lead to road closures on Nov. 11. National War Memorial: Tomb of the Unknown Soldier, Wellington Street, 11 a.m.
Road closures from 7:30 a.m. to 1 p.m.
Rideau/Wellington Street between Nicholas and Bank streets. Queen Street between Metcalfe and Elgin. Elgin Street between Wellington and Slater. MacKenzie Avenue between Murray and Rideau. Metcalfe Street between Wellington and Albert. O’Connor Street between Wellington and Queen. Bells Corners: Royal Canadian Legion​, 4026 Old Richmond Rd.​, 11 a.m.
Road closures from 10:30 a.m. to 11:30 a.m.
Centrepointe Drive between Constellation Crescent (south) and Chrysalis Way. Eastview/Vanier: Royal Canadian Legion, 294 Cyr Ave., 2 p.m.
North on Cyr Avenue between Royal Canadian Legion and Montreal Road. East on Montreal Road between Cyr and Hannah. North on Hannah Street between Montreal and Marier and to the Vanier Cenotaph for the ceremonial service. Kanata: Royal Canadian Legion, 70 Hines Rd., 11 a.m.
Road closures from 10:15 a.m. to 12:15 p.m.
East on The Parkway between Earl of March High School and Teron Road. South on Teron Road between The Parkway and Colchester Square. West on Campeau Drive between Colchester Square and John Mlacak Centre. Manotick/South Carleton: Royal Canadian Legion, 5550 Ann St., 11 a.m.
East on Beaverwood Road from Legion to Manotick Main. North on Manotick Main Street from Beaverwood to Clapp. East on Clapp Lane from Manotick Main and to the Manotick Cenotaph. Navan: Navan Cenotaph, 1295 Colonial Rd., 11 a.m.
Road closures from 10:45 a.m. to 11:45 a.m.
Colonial Road between Henn and Delson and to the Navan Cenotaph for ceremonial service. Orléans: Royal Canadian Legion, 800 Taylor Creek Rd., 11 a.m.
Road closures from 10:30 to 11 a.m.
Vimont Court and Taylor Creek Boulevard between Vimont Court and Royal Canadian Legion at 800 Taylor Creek Blvd., and to Orleans Cenotaph for ceremonial service. Osgoode: Royal Canadian Legion, 3284 Sunstrum St., 11 a.m.
Victoria Street between Eighth Line and Louise and to ceremonial service at Osgoode Cenotaph in front of Municipal Building. Richmond: Royal Canadian Legion, 6430 Ottawa St., 11 a.m.
Perth Street between Richmond Shopping Plaza and Richmond Memorial Park for ceremonial service. Stittsville: Royal Canadian Legion, 1481 Main St., 2 p.m.
Road closures from 1:45 to 2:45 p.m.
North on Stittsville Main Street between Royal Canadian Legion (1480 Stittsville Main St.) and Warner-Colpitts Lane. West on Warner-Colpitts between Stittsville Main and Stittsville Cenotaph for ceremonial service. Road closures from 10:15 a.m. to 11:30 a.m.
Main Street between Hazel Street and Beckwith Street (Beckwith Memorial Gate). Road closures from 1:30 to 3:30 p.m.
Rockdale Road between Devine Road and the Vars Cenotaph. Westboro: Royal Canadian Legion to Westboro Cenotaph, 391 Richmond Rd., 2 p.m.
Road closures from 1:30 to 3 p.m.
North on Winston Avenue between Royal Canadian Legion and Madison. South on Churchill between Madison and Richmond. West on Richmond between Churchill and Broadview and wreath laying and ceremonial service at the Westboro Cenotaph. Road closures from 1 to 2 p.m.
Constance Bay Road between McConnell Lane and Allbirch Road. Allbirch between Constance Bay and Legion. Food/grocery, tobacco, antique and handicraft stores with less than 2,400 square feet in total area used for serving/selling to the public. Pharmacies with less than 7,500 square feet in total area used for serving/selling to the public. Nurseries, gardening supply stores and florists. Businesses selling propane, diesel, natural gas and associated fuel products. Businesses dealing in the rental of motor vehicles and boats. Businesses dealing in the repair of motor vehicles and boats, which includes the portion of larger stores where vehicle repairs are being provided. In addition to that, here are details on other closures, plus services that remain open. Ottawa city hall and client service centres closed all day. Provincial offences court on Constellation Crescent closed all day. OC Transpo sales and information centres closed, except for Rideau Centre (open 12:30 to 9 p.m.). OC Transpo information centre (613-741-4390) open 7 a.m. to 9 p.m.
OC Transpo customer service centre closed. Sexual Health Centre and Satellite Clinics, SITE office, Dental Clinics and Well Baby Drop-In closed. Ottawa Public Health Information Line (OPHIL) closed but you can leave a message. City of Ottawa Archives, arts centres, galleries, theatres and museums will close. City of Ottawa Archives Reference Services and Gallery 112 will be closed. City-operated child care centres will be closed. All branches, departments and services of the Ottawa Public Library will be closed. No changes to garbage, green bin or recycling collection. OC Transpo runs a regular Tuesday schedule (free service for veterans who wear medals or uniforms​ for OC Transpo, Para Transpo, STO during week of Nov. 5 to 11). City of Ottawa parking regulations and restrictions apply. Recreation services and programs on regular schedules. The SITE Mobile Van will operate from 5 p.m. to 11:30 p.m.
Karsh-Masson Gallery, Barbara Ann Scott Gallery and OAG (Ottawa Art Gallery) Annex will remain open.